Important: this DVD only works on PCs and Mac. In this 4 DVD set Venerable Sangye Khadro teaches basic meditation practice. 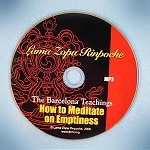 The teachings include practical instructions on meditation techniques and guided meditations. This teaching is great for those beginners who wish to begin a meditation practice and is also a useful refresher for those more experienced meditators. Teaching hosted at Land of Medicine Buddha, 2003.